Selling Difference – CDs by Zig Ziglar – Discount! 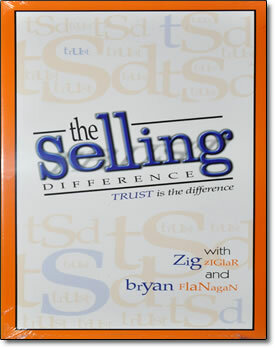 Developed by Zig Ziglar and Bryan Flanagan, The Selling Difference is designed to prepare the sales professionals of today to move to the next level of success in this evolving profession. Technological changes in the workplace and new demands for cross cultural negotiation abilities have created a need for a new skill set in the world of selling. The Selling Difference will provide you with a vehicle for this journey. The concepts and skills outlined by two of the most sought after experts in their field will enable you to arrive with confidence and comfort. This system will give you the information to build a better you, teach you to enjoy your career, and develop confidence and belief in yourself. How to sell value versus price. The four behavioral styles of your prospects and the selling tendencies for each style. How to use technology as an aid in the selling process. Cross cultural selling techniques making you a more effective sales professional in today’s global marketplace. To define the Features-Functions-and-Benefits of your products or services. The TRUST process in selling. Closing techniques from The Master Closer, Zig Ziglar. How to handle objections using the LQET formula. How to plan, prepare for and expect success each and every day of your sales career. The art of setting and achieving sales goals through a unique seven-step goal attainment procedure. Why selling is a proud profession and how you must be sold before you can sell. Superior questioning skills to increase your closing ratio.